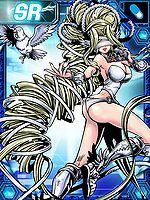 One of the Olympos XII, it is a Digimon that is filled with compassion and rules over love. Wherever Venusmon is, beautiful flowers bloom profusely no matter how ruined the soil is, and the land's youthful vigor is revived. 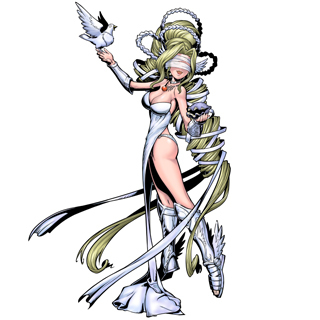 It is said that there are many Digimon who serve the pure and beautiful Venusmon. Venusmon can correctly perceive the world with its mind's eye by blindfolding itself, and it isn't taken in by any lie or deception. Furthermore, it restrains its overflowing glamour by concealing its pupils, so it's also a consideration to keep from adding more swooning Digimon. 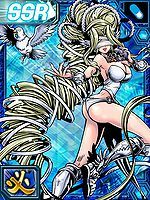 Venusmon is always accompanied by its bird "Olive" and its scallop "Hotan", small friends who can speak animatedly and unreservedly with Venusmon. 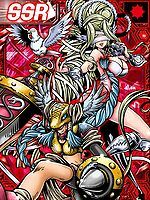 Because it is a Digimon that rules over love, it uses a fighting style that pacifies the opponent's heart with each gesture. Its "Healing Therapy" makes the opponent's fighting spirit vanish just by caressing their head, and those opponents who receive its "LOVE YOU" blown kiss fall over from the shock. Also, if they are pricked in the head by the bird Olive, then they get caught up in the "Peace Fantasia", which makes them have peaceful intentions no matter what kind of ferocious personality it has. Venus (「ヴェヌス」 Venusu) was the goddess of love and fertility. She is the Roman equivalent of Aphrodite in Greek Mythology. 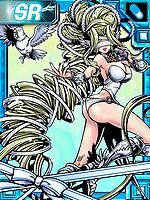 Healing Therapy  ヒーリングセラピー Hīringu Serapī Makes the opponent's fighting spirit vanish just by caressing their head. Blows a kiss that makes the opponents who receive it fall over from the shock. Peace Fantasia  ピースファンタジア Pīsu Fantajia Has Olive prick the opponent in the head, making it have peaceful intentions no matter what kind of ferocious personality it has. 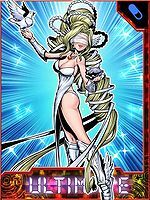 Venusmon can only be obtained as a collectible card. 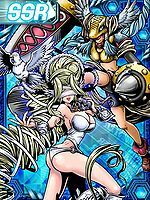 Venusmon is available as a Digimon Medal. Peace and flowers bloom in the world over which it watches with its mind's eye filled with benevolence. This goddess of affection spreads love and peace together with its friends Olive and Hotan, returning flowers to barren patches of land. It restrains its charm by covering its eyes, using its mind's eye to look at the world and discern the truth. This page was last modified on 29 January 2019, at 04:27.